We’d like to wish everyone a very happy, healthy, & prosperous New Year! Looking back on 2011, we’re really thankful for all of our great customers. It was just awesome to see so many repeats too! And even more so than sales, there were lots of new birdhouses and many types of bird feeders going into play for wild birds… that makes us happy 🙂 Peanut, Fly-Thru Recycled and Finch Feeders were especially popular, and we know the birds will love them! A big forgotten (but important) part of the holiday (and year round too) is the fine service provided by the USPS and FedEx. Although I’m furious with Fedex Billing at the moment… every holiday package was on time and no damages – so I guess that deserves a thank you. And as for the festivities tomorrow night: wherever you are, please be safe and have a wonderful time ringing in the New Year! It may be news from yesterday, but this is pretty darn cool! The U.S. Postal Service salutes five kings of the sky with the Birds of Prey stamps: the northern goshawk (Accipiter gentilis), peregrine falcon (Falco peregrinus), golden eagle (Aquila chrysaetos), osprey (Pandion haliaetus), and northern harrier (Circus cyaneus). These powerful birds are depicted in colorful portraits and shown from the neck up. The artwork appears against a plain, white background. Customers may preview the stamps on Facebook at facebook.com/USPSStamps, through Twitter @USPSstamps or on the website Beyond the Perf at beyondtheperf.com/2012-preview. Beyond the Perf is the Postal Service’s online site for the back story on upcoming stamp subjects, first-day-of-issue events and other philatelic news. Birds of prey, also known as raptors, thrive in diverse habitats and live on every continent except Antarctica. The roughly 500 species of raptors include birds that hunt by day, such as falcons, eagles, and harriers, and birds that hunt by night — the owls. They share several common characteristics. Birds of prey are carnivorous and use their powerful talons to capture prey. Their exceptionally keen eyesight allows them to see small objects in detail, even from a great distance. As predators high on the food chain, raptors play an important role in maintaining the balance of nature. Illustrator Robert Giusti worked with art director Howard E.. Paine on this issuance. Giusti painted the original designs in acrylic on canvas board. The Birds of Prey stamps are being issued at the three-ounce rate. The stamps will be issued Jan. 20, 2012, in Washington, DC. butterfly feeders, puddlers, and misters are fantastic last minute gifts! Omg, the last minute rush to find a perfect gift: imagine one that actually gets used and enjoyed, by the recipient and wildlife too?… it’s not too late! FedEx is including Saturday as a weekday delivery this year! We’re getting orders out the next day and most items are in stock. That’s a full weeks’ transit time if ordered tomorrow! 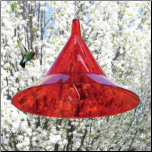 Hurry, there’s still time to find fantastic butterfly feeders and more with no expedited shipping charges. 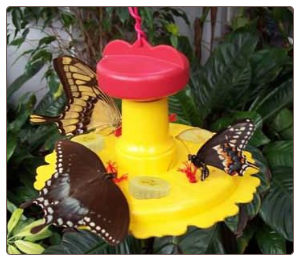 This butterfly feeder includes a package of nectar, wicks for real feeding, and small spikes to offer fruit… that’s why it works 🙂 It features both pole-mount and hanging options too. The Butterfly Puddlers have been extremely popular this year, we’ve sold out twice and have more on the way! Hand crafted in weatherproof stoneware and recycled glass, they may be used as butterfly feeders offering over-ripe fruit, or as baths- using sand and salts. 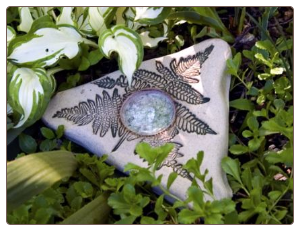 A lovely garden accent to boot, this item will bring many seasons of use. 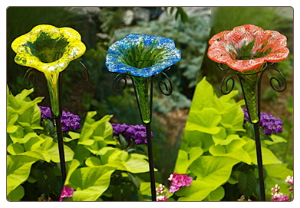 Another popular type of butterfly feeder is the staked, large glass flower. They may be used as a bath or feeder, but the trick to getting butterflies to drink nectar from this type of open feeder is to add a piece sponge to the flower (preferably a new one). Soaking up the nectar, the sponge acts as a wick that imitates nature and the way butterflies actually draw nectar from flowers. Still available, but in yellow only. And lastly, if you really want to see some butterfly action this summer, leaf misters work like a charm! The activity in a garden around a leaf mister in summer is truly amazing. Stake one of these in the ground around some lantana, milkweed, or abelia, and enjoy the show. Hummingbirds and songbirds love them too. Simple to install, there are several options for use. We like the ground stake option, as the mister placement may be easily changed every few days. This avoids saturation in any given spot. 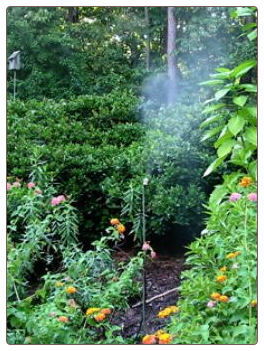 Other birds will leaf bathe, hummingbirds dart in and out of the mist, while butterflies “flut” around… it’s very cool! The misters create a “spa-like” atmosphere that you could sit and watch for hours. So there it is, great last minute gifts to entice these winged wonders… all in stock for immediate shipping! The Pop-Outz is Great for Nesting Materials Too! This mod, recycled plastic thing is called a Pop-Outz. 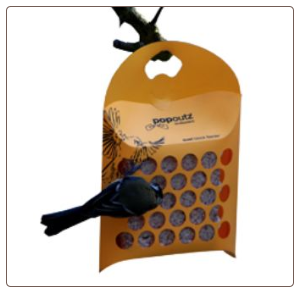 It’s actually a suet feeder that makes for a new and fun way to feed birds this convenient an economical treat. Suet greatly benefits birds in winter as it’s loaded with extra fat and protein. These calories are converted into energy which helps birds stay warm in frigid weather. Versatile? You bet! Pop-Outz make for the perfect vessel for offering nesting materials to birds. In our notes to customers, here’s what we tell them: “In early spring the Pop-Outz is perfect for offering nesting materials. Bright cotton yarns, feathers, decorative mosses, and even pet hair are a few favorites to encourage nest building around the yard. Just fill, pull some materials through the holes to get started, and hang from a branch where birds will see it. Enjoy!” Now if you’ve made a purchase with The Birdhouse Chick in the past year or two, you’ve likely seen that note before! Nesting materials will usually work in any kind of suet feeder, but these are just fun, and something a little different than the standard cage. Put your suet feeder to work super duty year-round. In summer, fruit is a great choice for migratory birds, whole peanuts work well in cold weather, and of course, load up with home made nesting materials in early spring to encourage nest building around your yard!